Something I never thought I’d say: I think I might be starting to like peas! They’re still probably my least favourite vegetable, but I actually almost enjoy them these days. Almost. 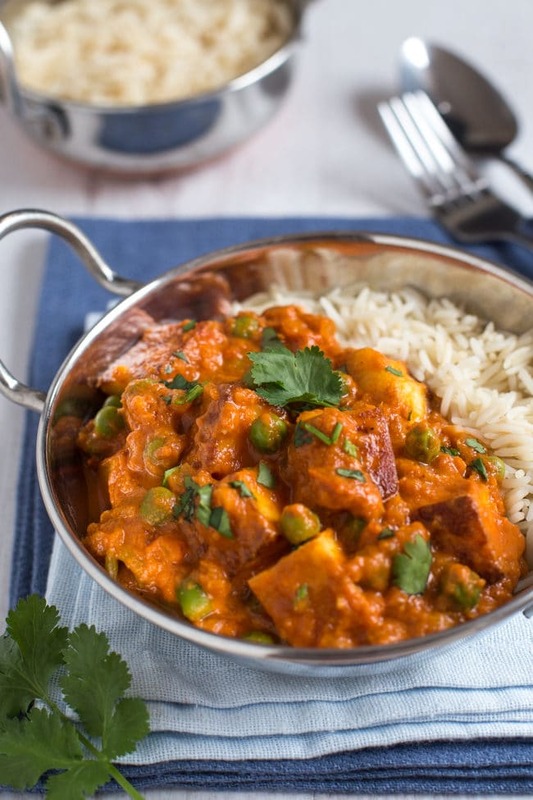 It definitely helps when they’re smothered in a luscious sauce like in this muttar paneer masala. 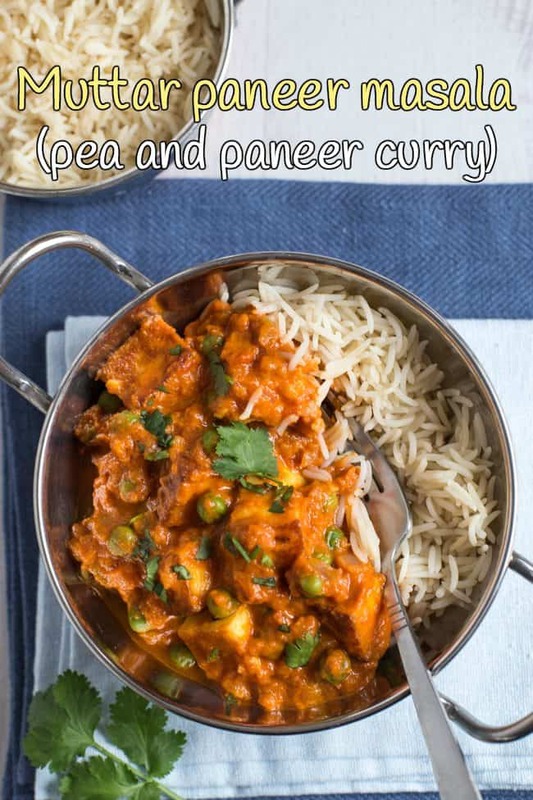 For those of you who aren’t hugely familiar with Indian-inspired food, muttar means peas, and paneer is a dense, creamy cheese that’s really common in curries. And I pretty much love anything that’s served with cheese, so I’m happy. A cheese curry might sound a little odd, but we’re not talking about lumps of cheddar here (although…?!). 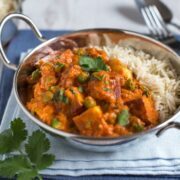 Paneer doesn’t have a huge amount of flavour itself, just a lovely creaminess, so it’s great for soaking up tasty curry sauces. 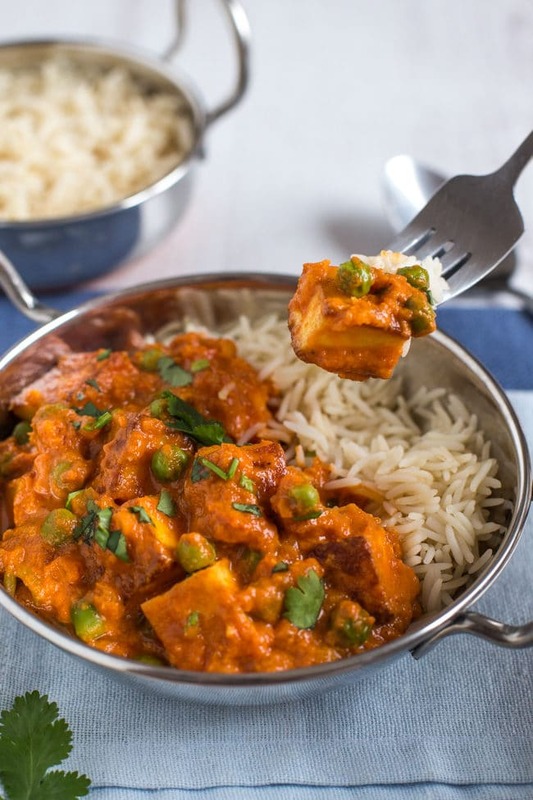 It’s my favourite – I always order some kind of paneer dish when we get Indian food. I usually get saag paneer every single time, but I’ve been trying to branch out a bit lately, and paneer masala is a new favourite. It’s super rich and creamy – not particularly spicy, just ever so slightly sweet, and really luxurious tasting. Of course, this is my own entirely non-authentic version of muttar paneer masala. If you want a real Indian recipe, look elsewhere (unless I’m an accidental culinary genius and have come up with an authentic recipe entirely on my own… but let’s face it, that’s pretty unlikely). 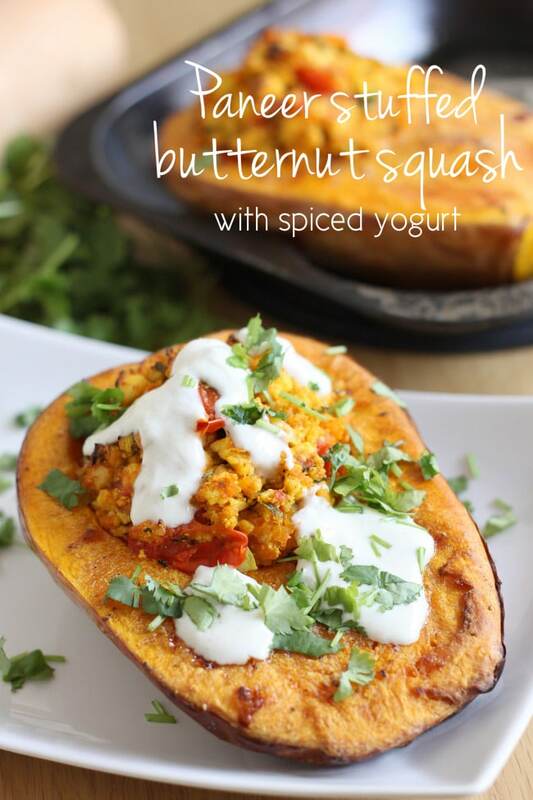 This version is quick and easy to make though, and tastes great, so I’m not particularly bothered about authenticity. 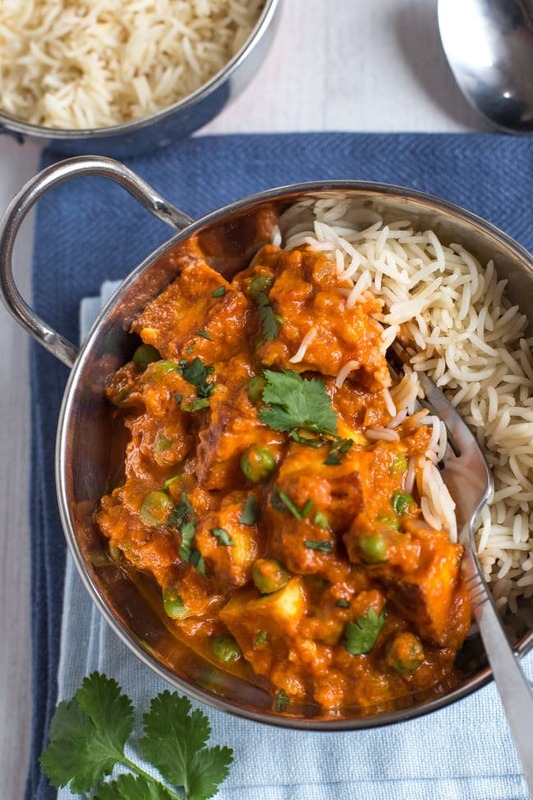 Don’t worry if your spice cupboard isn’t stacked to the ceiling – this muttar paneer masala only uses a few everyday spices. I’m not keen on buying tons of new ingredients for recipes that I’ll only use once, and will then clutter up my cupboards forever more, so I try to keep things simple. I basically use the same 10-ish spices in everything I cook (only 4 in this curry! ), and it seems to work for me! Heat a dash of oil in a large frying pan, and add the diced paneer in a single layer. Cook over a medium-high heat for 5 minutes, turning the pieces of cheese regularly, until golden brown. In a separate frying pan, heat another dash of oil. Add the diced onion and minced garlic, and cook over a medium heat for a few minutes, until soft and translucent. Add the spices, and cook for 1 more minute, stirring regularly. Next add the tinned tomatoes, and bring to a gentle simmer. Using an immersion blender, carefully blend the tomato curry sauce to your desired smoothness. Add the cream, frozen peas and sugar, along with a generous pinch of salt and pepper. Bring to a gentle simmer again, and cook for a few minutes until the peas are defrosted. Add the fried paneer, and serve topped with some chopped coriander (cilantro). Definitely gonna give this a try. 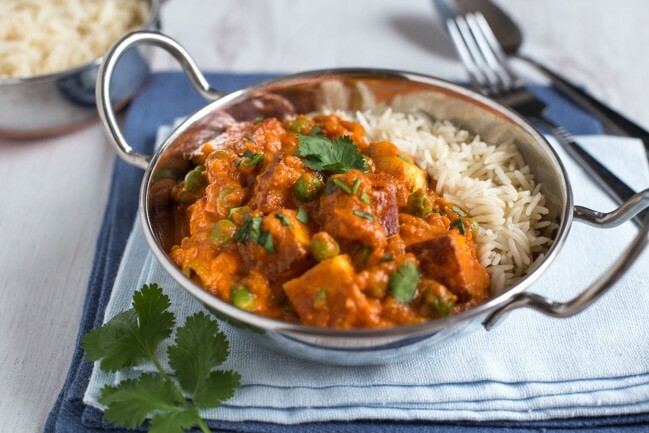 We love Indian food, especially if it includes Paneer. My brother brought me the little (rice) one back from his travels! And the larger (curry) one, I can’t remember… maybe Wayfair? Looks like they do them (here), looks a slightly different shape to mine so probably not the exact one I’ve got but looks good enough! What is “single” cream? Is this the same as heavy cream? I am given to understand from other sources that heavy cream is more like our whipping cream, and our single cream is more like the American half-and-half. But I’m sure any kind of cream would be delicious in this recipe – I don’t add it myself, as I tend to put a dollop of yoghurt on to my curries. Yes that sounds about right! This looks delicious! I’m definitely giving this one a try, love paneer in curry. This one is making my mouth water! I have made my own paneer in the old days when I could still be bothered to do that sort of thing (I think it’s nicer than the packs I’ve tried!) but you’ve used all my favourite spices in this and I know they’ll totally transform the paneer! 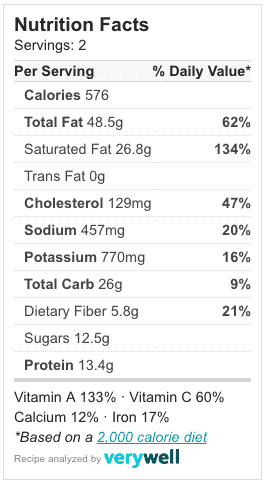 Cautionary tale: a few years ago I ordered saag paneer and when it arrived they’d used cheddar – it was vile, seriously horrible! I should have said something, obviously, but I didn’t want to make a fuss and appear to be telling them their job! They must have run out of the real stuff and thought their customers wouldn’t know the difference…..
‘ADD SLICES’. Slices of what?? It was supposed to say spices, sorry! Fixed it!